Watch athlete Dane Jackson on this jaw-dropping kayaking journey over waterfalls to get your adrenaline rush for the day. Thunderstorm season is here and that means lightning. And lightning means possible power surges. 3 Rivers recommends that customers use a surge protector with their computers (as well as TVs and any other sophisticated home electronic devices). Computers are filled with voltage-sensitive components that a power surge could damage very easily. At minimum, this damage will shorten the life of your computer, and could wipe out all of your saved data. Computers are very expensive items, and the data they hold is often irreplaceable, so it makes sense to invest in a quality surge protector from your local hardware or electronics store. Another good idea is to keep a "hard-wired" telephone handy. That is, a phone with the hand set actually connected to the phone with a cord, not a cordless phone. 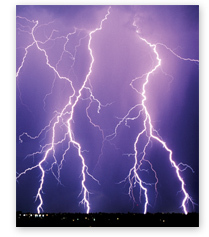 A power surge or thunder storm could cause a cordless phone to seem like it has "gone dead." It may act like the phone was left off hook, but you will not know that the telephone line itself is fine unless you unplug all cordless phones, answering machines, routers, etc., and then connect a hard-wired phone to the phone jack to see if you get a dial tone back. This is always a good thing to check before calling 3 Rivers with a possible outage. wateruseitwisely.com – Quick, think of 100 ways to conserve water! On second thought, just visit this site, which has already done the thinking for you. Here you can also learn about water-saving products, how to use less water in caring for your landscape, how to get kids involved, and many other useful tools. epicurious.com – There's still enough summer left to get your burger on, and this site can help you do it. Grilling experts Steven Raichlen and Chris Schlesinger walk you through cuts of meat, seasoning, and cooking. You'll also find classic, kid favorite, upscale, and international recipes, as well as some non-beef options. ted.com – TED is a nonprofit organization devoted to spreading interesting ideas, usually in the form of short, powerful talks, which are available in video format on this site. Enduring love, driverless cars, how babies think, why startups succeed, and why people laugh are just a few of the fascinating topics you'll find here. commonsensemedia.org – To help you use media and technology as a positive force in kids' lives, this site offers reviews of movies, games, apps, websites, TV shows, books, and music. You can also read articles about specific concerns like privacy and Internet safety. Don't forget to check out the family guides, blogs, videos, and other useful tools. Short Tutorial/FAQ – How Do I Remove Something Posted On My Facebook Timeline? Go to your Timeline and scroll to the story you want to remove. Click the downward arrow in the upper-right corner. Choose Hide from Timeline to remove the story from your Timeline. When you use this option, the story will still be on Facebook, but others won't be able to see it. If you don't want something you're tagged in to appear on your Timeline, you'll need to remove the tag. To do this, click the downward arrow and select Remove Tag. The post will no longer appear on your Timeline, but it may still be visible in other places on Facebook, such as the News Feed.